258 pages | 36 B/W Illus. How children experience, negotiate and connect with or resist their surroundings impacts on their health and wellbeing. In cities, various aspects of the physical and social environment can affect children’s wellbeing. 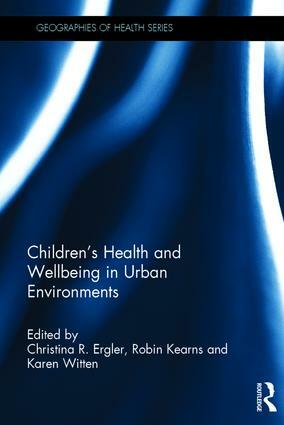 This edited collection brings together different accounts and experiences of children’s health and wellbeing in urban environments from majority and minority world perspectives. Privileging children’s expertise, this timely volume explicitly explores the relationships between health, wellbeing and place. To demonstrate the importance of a place-based understanding of urban children’s health and wellbeing, the authors unpack the meanings of the physical, social and symbolic environments that constrain or enable children’s flourishing in urban environments. Drawing on the expertise of geographers, educationists, anthropologists, psychologists, planners and public health researchers, as well as nurses and social workers, this book, above all, sees children as the experts on their experiences of the issues that affect their wellbeing. Children’s Health and Wellbeing in Urban Environments will be fascinating reading for anyone with an interest in cultural geography, urban geography, environmental geography, children’s health, youth studies or urban planning. 3. How Does the Neighbourhood Built Environment Influence Child Development? 5. Is Society Now Being Social? Christina R. Ergler is a Lecturer in Social Geography at the University of Otago, New Zealand. Robin Kearns is a Professor of Geography in the School of Environment at the University of Auckland, New Zealand. Karen Witten is a Professor of Public Health at Massey University, New Zealand. There is growing interest in the geographies of health and a continued interest in what has more traditionally been labeled medical geography. The traditional focus of ’medical geography’ on areas such as disease ecology, health service provision and disease mapping (all of which continue to reflect a mainly quantitative approach to inquiry) has evolved to a focus on a broader, theoretically informed epistemology of health geographies in an expanded international reach. As a result, we now find this subdiscipline characterized by a strongly theoretically-informed research agenda, embracing a range of methods (quantitative; qualitative and the integration of the two) of inquiry concerned with questions of: risk; representation and meaning; inequality and power; culture and difference, among others. Health mapping and modeling, has simultaneously been strengthened by the technical advances made in multilevel modeling, advanced spatial analytic methods and GIS, while further engaging in questions related to health inequalities, population health and environmental degradation. This series publishes superior quality research monographs and edited collections representing contemporary applications in the field; this encompasses original research as well as advances in methods, techniques and theories. The Geographies of Health series will capture the interest of a broad body of scholars, within the social sciences, the health sciences and beyond.